Are you taking the first footsteps in the long road of photography and photo editing? Do you have experience but you don’t have time enough for long sessions using topnotch complex software or perhaps your budget is too low to even think of buying the latest suite everybody is talking about? If any of that is true then you’ve come to the right place. I would like to recommend to you a very solid all-in-one tool that is fast, intuitive, incredibly easy to use and what’s best, affordable! 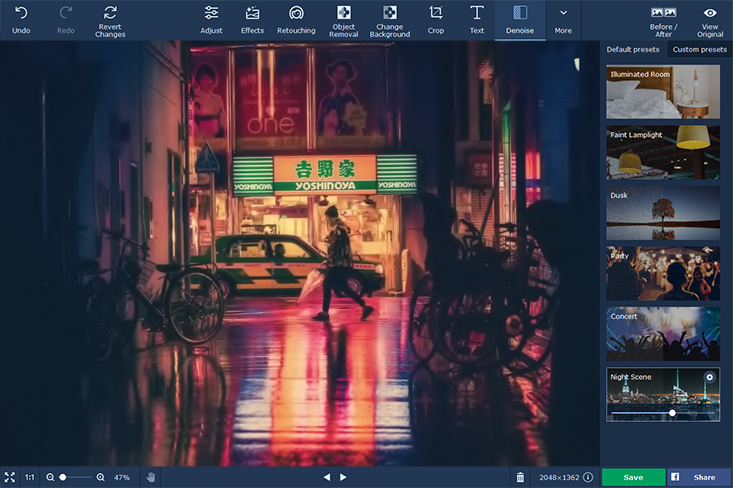 This tool is the Movavi Photo Editor and among its many strong points I would like to place emphasis on the photo effects which is the main reason I fell for this software. In a world in which social media claims for striking images to stand above the crowd, sharing pictures that are edited with the right effects and doing it fast can help you create a style of your own or may give more strength to the ideas you want to transmit. The Effects option is an exquisite selection of multi-purpose filters that range from Classic to Color fantasy, as you can see in the capture below. The Movavi Photo Editor 5 effects allow you to create that striking vignette in one or two clicks, a result that otherwise would take working with layers or using a plugin in other products. Adjusting the intensity with the sliders you can tune up your latest shot using the Classic - Lomo effect or the Retro – Nosferatu to produce highly attractive images or perhaps if you prefer softness you may apply a gentle warm bokeh in the Texture section. Photography is like painting sometimes so a Gauguin or El Greco filter can turn you pic into a masterpiece. And last but not least, a special mention to the Tilt-Shift effect inside the Artistic module that you miss sometimes in similar products. The fact that there is a list of the most popular effects all in one place saves some time while at work. And the Surprise Me button might come up handy when you are not sure about what effect to choose. To finish I have to say that what I enjoy the most is to have a preview of all the effects applied to my image on the right panel next to the original so I anticipate results. In any photography working space you need to have a certain order so your workflow is logical and you don’t get distracted by too many windows. Having all at hand and organized is a most. A long welcoming tour can be overwhelming sometimes although newbies need some leads as to where is what. This software handles that by implementing an easy 8 steps guide which is more than enough for starters. This tool does many, many things, in an almost insulting, simple and robust way, but you need to know how to remove an object or change a background sometimes for example. To take care of that you have a comprehensive user guide and how to section in the top menu plus some extra visuals while you work for fast understanding of the procedure. 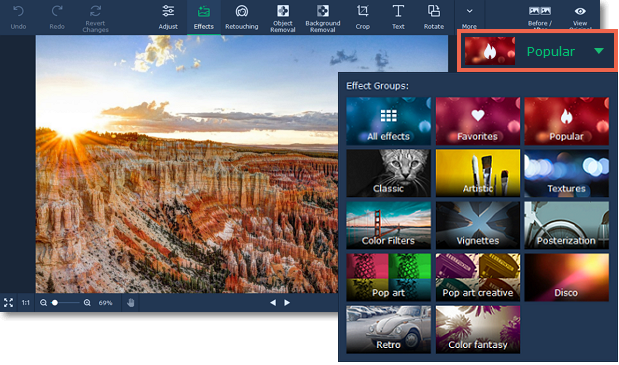 The program allows you to drag and drop images besides the usual browsing and gives you the possibility to resume the last edited picture prioritizing speed in the creation process. Movavi inputs most common image file formats, including RAW and TIFF files although it cannot output GIF for example. For the full list check the User Guide. There is a wide range of post processing options in the editor but I will concentrate on the ones that I find more useful to me as a photographer and social media enthusiast. Adjust: Usual adjustment options with sliders. All in one set not in different modules like in other programs. I love the so called Magic Enhance option on top that works superbly to save you all the tweaking with wonderful results. Retouching: Did you ever need a fast retouching tool for those freckles in your subject’s face, cleaning that dust spot in your skies or whitening those unnatural yellow teeth? This option solves that last minute annoyance in seconds when you are sharing pictures in Facebook for example, a couple of clicks and voila. Object Removal: With different selection tools you can swipe out an entire object leaving no trace of it. While the process takes place, you get nice trivia info on photography topics on screen. Change background: But what about if you want to throw away the whole background that is ruining the fantastic magic moment of your model? This tool works neatly in this respect. Maybe you need to learn how to use the brush or the lasso tool but you have a visual on top to explain how it works. Possibilities are infinite with Movavi Photo Editor. The ability of sharing to Facebook directly from the interface is awesome. I think some more popular networks would be appreciated in future updates though. I hope this article is useful to you and helps you make the best out of your pictures! Well, that is obvious my friend, I use it too but as I commented, this editor saves time and it is good for social media. Thanks for your comment Saksham! Your photographs are absolutely great. I love the style. Moreover, I am sure you can make them look better with iphotoplugins.com.